NATURAL HABITAT AND PREFERRED SITE: Deep rich soils of Oklahoma, Arkansas and small parts of deep, east Texas. IDENTIFICATION INFORMATION: Upright, to pyramidal shape, especially when young, spreading with age, has red oak type leaves and usually a weeping nature, especially on the lower limbs. It has a stiff overall appearance. FLOWERS AND FRUIT: Flowers form in the early spring, April through May, separate male and female flowers on the same tree. Fruit are small acorns that form September through October forming every other year. BARK: Light brown to gray, smooth and lustrous when young, get darker and roughened with age. FOLIAGE: Leaves are simple, alternate and deciduous, 4 to 6 inches long. Fall color is usually red but can also be yellows and variations. The fall color display is usually quite good. CULTURE: Nuttall Oak – Quercus nuttallii, which is also known by other common names such as red oak, river red oak, pin oak and striped oak, is a similar tree and one of the most rare in Texas. It grows in poorly drained soils and does well in areas where there is winter flooding and year-round moisture. It will not grow in the calcarious soils of north and central Texas. Pin oak won’t grow in either of those situations. 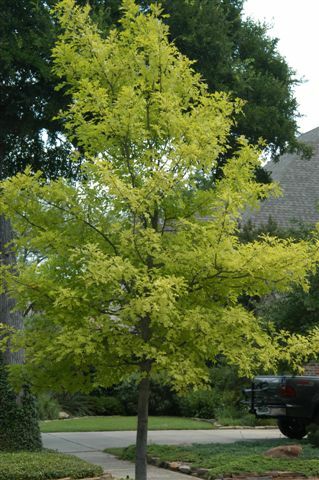 PROBLEMS: Pin oak develops chlorosis quickly in alkaline soils. This trace mineral deficiency leads to the attack of other insect and disease pests. PROPAGATION: Propagation by planting the acorns immediately after they release from the tree in the fall. INSIGHT: Oaks cross breed readily and pin oak crossing with Texas and Shumard red oaks is a major problem in Texas. Red oaks that have much pin oak blood will not grow in the black and white soils of North Texas.